"Now You Can Get Certified in NLP From Home Using High-Quality Digital Videos of Our Live NLP Practitioner Training... It's Practically Like Being IN the Training Room With Michael Stevenson!" Now, you can Become Certified in the Comfort of Your Own Home in Neuro-Linguistic Programming (NLP), TIME Techniques, Hypnotherapy, EFT and Success Coaching in this powerful online course! Within the next two minutes, you'll find out how you can get certified in NLP with less time and investment and all from the comfort of your own home! 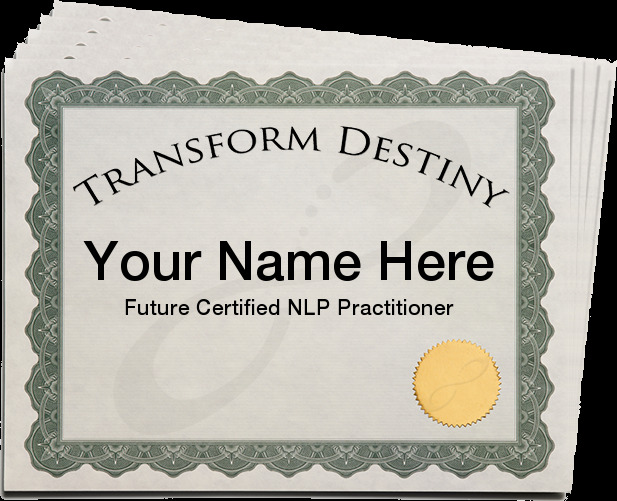 By becoming certified in NLP from home, you're rewarding yourself with the most powerful skills on the planet to transform the lives of the people around you, professionally and personally — even your own life! When you learn NLP you will find out how to make major transformations in yourself and others easily, effortlessly and more quickly than you ever thought possible. Join me, Michael Stevenson, for this captivating program designed for novices and experts alike!! You'll receive certificates in NLP, TIME Techniques, Hypnotherapy, EFT and Success Coaching. Just want to learn NLP without certification? Click here to check out our non-certification form of this course, NLP Practitioner Video Collection, at a great discount! "The home-study materials are an excellent resource." "I was surprised at how easily NLP could be applied to produce rapid and deep changes. Neuro-Linguistic Programming is the culmination of over 40 years of modeling excellence so that it can be taught to others. All of this was put into a model you can learn from home. A training that is guaranteed to change your life by teaching you the skills to manage your state, take hold of your life and create success everywhere you go. With NLP, you'll learn self-help techniques used by the likes of Tony Robbins, Phil Jackson, Oprah Winfrey and Bill Clinton. You'll learn the skills of world-class communicators — becoming more influential and persuasive than ever been before. You'll learn sales techniques of the best, including how to turn any objection to your advantage and how to close with the super-simple NLP Five-Step Sales Process. You'll learn powerful social skills such as how to get into rapport with anyone in seconds. You'll learn how to overcome negative emotions and limiting beliefs with TIME Techniques, conversational hypnosis and more. There isn't a single area of life that NLP doesn't affect. And now, you can learn it all from home! We'll teach you how to use all the NLP Practitioner-level tools to use on yourself for your own personal growth, and to use with others professionally for therapy and coaching. Learn powerful techniques for hypnotizing people in every-day conversation using the hypnotic language patterns of Milton H. Erickson, one of the most gifted hypnotists who ever lived. Learn how to coach yourself and others to success with the simple seven-step CORE Success Coach Method, created by Transform Destiny Founder, Michael Stevenson, and based on the principles of Neuro-Linguistic Programming. As soon as you enroll and get instant access, you will be riveted with new ideas, strategies and insights and with new approaches to getting what you want as quickly as you want it. What's Included in the NLP Practitioner Home Study Course? The same pre-study audio program students of our live Practitioner training receive. This program teaches you the foundational and theoretical aspects of NLP to prepare you for the video training. This is a recording of a live course — every minute of instruction captured for you, just as if you were there. Teaching you an additional form of hypnosis (The Krasner Method) and explaining, in detail, how to run one hour sessions professionally. A powerful seven-step method for coaching, taught online in videos you can watch from home. Emotional Freedom Techniques (sometimes known as "Energy Tapping") taught in videos you can watch from home. Allowing you to get answers to your specific questions. Do I Have To Be A Therapist or Coach to Learn This? NO!! While NLP can be used in coaching and therapy, everything taught in this course can be used on yourself, your children, family, friends, co-workers and more. There are no prerequisites and there's no degree required. As a matter of fact, many people who learn NLP use it only for themselves! People from all walks of life learn NLP with me because they say they want to learn from the best, including parents, sales associates, healthcare workers, therapists, public speakers, law enforcement, chiropractors, coaches, managers, retirees, writers and more. You! So sign up already!! "I was surprised at how easily NLP could be applied to produce rapid and deep changes. The home-study materials and pre-loaded iPod are an excellent resource." "Michael's instruction in NLP was absolutely invaluable to me in my profession and with my clients, as well as with my family and friends. The concepts I learned in this class apply to every aspect of my life." "I signed up for NLP Practitioner and couldn't wait for it to start. Fortunately, Michael included awesome pre-study material and an iPod that I dove right into. I spent my afternoons with my shiny new iPod and Michael's hypnotic voice by the poolside, giddy as could be learning about anchoring, sub-modalities, and all the other Neuro-Linguistic Programming ideas. Little did everyone at the pool know I was learning things that would change my life forever... all while they were just getting a tan. Thanks again Michael!" Ours are the best programs in the industry because we do more! Our trainings meet and exceed the required standards that other institutes teach, so we deliver the most amazing, life-changing experience you've ever attended. We are 100% committed to your success. That means that we'll do what it takes to help and support you. Michael and our other trainers are fully available to you before, during and after the program to help you create success with NLP. Fourteen hours of NLP Audios so you'll start learning right away! All of this will be delivered digitally online. Images are illustrative only, so there's no need to wait for shipping. You get immediate access! We understand that times have been tough. That's why we've created our new flexible payment plans to make getting your NLP Practitioner Certificstaion a reality for you. As long as your payments are current and your account is in good standing, you can continue taking the training. "This Program Is Far And Away The Best"
Just log into our NLP Practitioner Online Certification Course website and play the lessons on your laptop, mobile phone or tablet. At the end of the process, submit your final exam and a video of yourself doing the NLP techniques taught in the course. Your NLP Trainer will personally monitor your results throughout this course and will be available for questions by email, by message board, and by phone. After completing this course and passing your final examination and video, you'll receive completion certificates in NLP Practitioner, Clinical Hypnotherapist, TIME Techniques Practitioner, EFT Practitioner and Success Coaching - all from the comfort of your own home! This is a work-at-your-own pace training! You can watch the course and take the test at whatever pace you'd like, though most people finish it in one to three weeks. There are only so many questions we can answer and tests we can grade at a time, due to to the intensive manual work that goes into evaluating an NLP Practitioner Home Certification Student, so I've had to limit the enrollment size of this course. These spots are already going quickly so enroll now to receive your instant login! This is an incredible value, and a breakthrough in the field of NLP training. A live training with us would not only take seven days away from home, but in addition to the tuition, would cost MORE with travel and lodging! No other training offers this combination of online tools and services specifically designed to create your success with NLP. Get The NLP Practitioner Certification Home Study Course Now! The NLP Practitioner Video Training - Recorded in HD Video and HQ Sound from a LIVE NLP Practitioner Training!